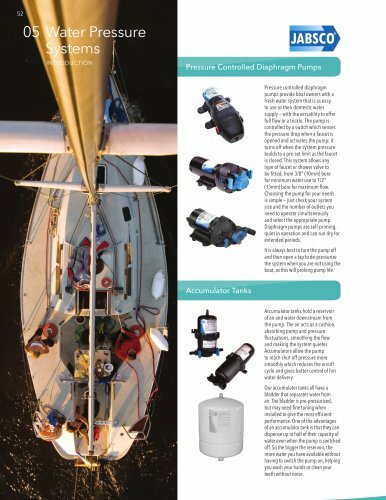 Pressure Controlled Diaphragm Pumps stems DUCTION Accumulator Tanks Pressure controlled diaphragm pumps provide boat owners with a fresh water system that is as easy to use as their domestic water supply - with the versatility to offer full flow or a trickle. The pump is controlled by a switch which senses the pressure drop when a faucet is opened and activates the pump; it turns off when the system pressure builds to a pre-set limit as the faucet is closed. This system allows any type of faucet or shower valve to be fitted, from 3/8" (10mm) bore for minimum water use to 1/2" (13mm) bore for maximum flow. Choosing the pump for your needs is simple - just check your system size and the number of outlets you need to operate simultaneously and select the appropriate pump. Diaphragm pumps are self-priming, quiet in operation and can run dry for extended periods. It is always best to turn the pump off and then open a tap to de-pressurize the system when you are not using the boat, as this will prolong pump life. Accumulator tanks hold a reservoir of air and water downstream from the pump. The air acts as a cushion, absorbing pump and pressure fluctuations, smoothing the flow and making the system quieter. Accumulators allow the pump to reach shut-off pressure more smoothly which reduces the on/off cycle and gives better control of hot water delivery. Our accumulator tanks all have a bladder that separates water from air. The bladder is pre-pressurized, but may need fine tuning when installed to give the most efficient performance. One of the advantages of an accumulator tank is that they can dispense up to half of their capacity of water even when the pump is switched off. So the bigger the reservoir, the more water you have available without having to switch the pump on, helping you wash your hands or clean your teeth without noise.